Chancellor Robert Birgeneau was among six university leaders who met with Obama at Carnegie Mellon University on Friday, June 24, during the launch of the Advanced Manufacturing Partnership (AMP). These university presidents and chancellors will work with leaders of major U.S. manufacturers and federal government leaders to build a roadmap for advanced manufacturing technologies. The AMP will be led by Andrew Liveris, chairman, president and CEO of Dow Chemical, and Susan Hockfield, president of the Massachusetts Institute of Technology. “We are still the largest manufacturing country in the world by volume, but a lot of manufacturing is going overseas, in part because we aren’t creating and replenishing the skilled workforce that can actually run the facilities and machinery that make today’s advanced products,” said David Dornfeld, chair of mechanical of engineering, who is working with Birgeneau on the AMP. The president’s plan will leverage existing programs and proposals but also invest more than $500 million in key areas to jumpstart the effort. 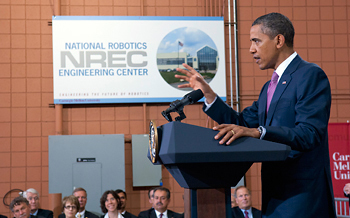 These areas include: building domestic manufacturing capabilities in critical national security industries; reducing the time needed to make advanced materials used in manufacturing products; establishing U.S. leadership in next-generation robotics; increasing the energy efficiency of manufacturing processes; and developing new technologies that will dramatically reduce the time required to design, build, and test manufactured goods. Leading universities and companies will complement these federal efforts helping to invent, deploy and scale these cutting-edge technologies. “Today, I’m calling for all of us to come together- private sector industry, universities, and the government- to spark a renaissance in American manufacturing and help our manufacturers develop the cutting-edge tools they need to compete with anyone in the world,” Obama said. The AMP is being developed based on the recommendation of the President’s Council of Advisors on Science and Technology (PCAST), which released a report June 24 entitled “Ensuring Leadership in Advanced Manufacturing.” The PCAST report calls for a partnership between government, industry and academia to identify the most pressing challenges and transformative opportunities to improve the technologies, processes and products across multiple manufacturing industries. UC Berkeley has always had a very strong tradition in manufacturing, Dornfeld said, most prominently in the semiconductor industry involving methods for making integrated circuits. But it has also had an impact on traditional industries, such as automotive manufacturing, precision manufacturing and microelectromechanical systems (MEMS), and design and control of advanced vehicles. Among current projects are new initiatives in robotics, sustainable product design and manufacturing, energy and biotech production and health care. The College of Engineering also will launch this fall a new, one-year Professional Master’s program that will include elements of entrepreneurship and manufacturability and innovation. The degree program has been created through the new Coleman Fung Institute for Engineering Leadership “to address the concerns that we are not providing a workforce which is able to treat the needs of industry in manufacturing,” according to Sastry. UC Berkeley, MIT, Carnegie Mellon University, Georgia Institute of Technology, Stanford University and the University of Michigan have made a commitment to form a multi-university collaborative framework for sharing of educational materials and best practices relating to advanced manufacturing and its linkage to innovation. “I think we are going to see a rebirth of interest in manufacturing, and in fact, we’re seeing that now in our mechanical engineering students,” Dornfeld said. He referred to a recent study that identified 1.5-2 million jobs now unfilled in this country because the workforce lacks the skills needed to operate advanced manufacturing equipment. For more details on the AMP, link to the White House press release.